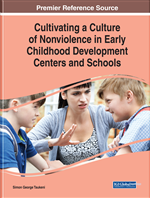 Children experience varying degrees of violence at a tender age compelling the need for pastoral care, an antique model of emotional and spiritual support. Pastoral care is regarded as individual and communal patience in which people trained in pastoral care offer support to people suffering from anxiety, pain, loss, and other traumatic circumstances. Neuroscience submits that most learning occurs in the early years making it imperative that during this period a conducive environment is created for maximal cognitive, social, emotional, and spiritual development of the child. This can be achieved through non-biased pastoral care support for the victims and perpetrators to ensure repentance, forgiveness, and sustainable transformation thereby creating a non-violent society. While pastoral care has its roots in Christianity, ways of integrating it with other religions are essential in a multi-cultural and multi-traditional society. This chapter explored the challenges and benefits of pastoral care. This chapter is founded on the belief that children’s internalised experiences from a tender age have a detrimental effect on their development later in life. Neuroscience informs us that during pregnancy the baby in the mother’s womb can slightly hear upheaval noise in the exterior environment besides hearing the mother’s heartbeat and breathing rhythm (Bhamani, 2017; Kleindorfer & Robertson, 2013; Partanen, et al., 2013). From birth, children communicate loud and clearly through crying, bubbling, chuckles, gestures and facial expressions which form the attachment but often they are misunderstood, silenced or given a deaf ear by those meant to nurture them. This mother-baby attachment is a biological instinct that is crucial in shaping the nature of the attachment and later relationships (Ainsworth et al., 1978; Bowlby, 1988; Thompson, 2000). The onus remains on the caregiver to passionately listen to the silent voice of the child in early childhood as it promotes the psychological development of the child. De Boeck and Honwana (2005) believe that children’s voices are worth listening to as it is essential for their continued existence and development, besides being a social justice and adhering to the rights of children. The chapter discusses the realities in terms of a myriad of adversity issues children face such as poverty, orphanhood and chronic illnesses. Worldwide, children are subjected to abuse, toxic stress, neglect and marginalisation which need urgent attention if we are to have a stable future nation. Alleviation of the predicament children face in their homes and the urge to uphold the right to peace enshrined in the Rights of the Child compel the adoption of pastoral care and counselling in the early childhood settings where children spend most of their time. Hence, the aim of this chapter is to focus on pastoral care, pastoral counselling, and psychological therapy, processes of healing in circumstances such as bereavement, abandonment, abuse, and trauma that the youngest generation face today. Case studies have been used to exemplify different forms of abuse that require pastoral care and questions are posed on how pastoral care can be used to deal with the various problems. Define pastoral care and pastoral counseling in the context of early childhood development. Identify challenges encountered by children and distinguish the type of intervention that will best address them. Develop the practitioners’ insight into listening empathetically to the communication of the children. Be empowered to offer social and emotional care to children in various exigent circumstances. Create a supportive environment that is sensitive to meet the needs of children without prejudice. Promote cognitive, emotional and social development in a healthy and safe environment. Caring: Displaying kindness and showing concern for others or can be defined as a way of looking after those that are incapable of caring for themselves, particularly because of age, illness, or vulnerability. Bereavement: The period after loss during which grief and mourning are experienced especially after the death of a loved one. Bereavement may refer to death of a parent or sibling, following parental conflict or divorce, or any other loss in a person’s life. Shepherding: A term that originates from the biblical perspective that denotes the work of a shepherd in herding, tending, and ensuring safely of the sheep. Pastoral care is like shepherding where one nurtures, guides, comforts the child to make them more confident in dealing with emotional issues affecting them. Early Childhood: A foundational phase in humans between birth to the age eight or nine, which is characterized by rapid physical, cognitive, emotional development, and the need for high care. Empathy: The ability that empowers the counselor to communicate sympathetically to the client. It entails responding to the clients in three dimensions which are; perceptiveness, know how, and assertiveness. It is the aptitude to understand, be aware of, and be sensitive and indirectly sharing and experiencing the feelings, opinions, and thoughts of another. Trauma: An extremely stressful situation that overwhelms the child’s ability to cope or behave normally. Trauma happens after unpleasant experiences such as child abuse, neglect, parental conflict, societal conflict, buffeting relationships, and persistent deprivation or ostracism. Counselling: The skilled and principled use of relationship building methodologies to facilitate self-knowledge, emotional acceptance and growth, and the optimal development of personal resources. The overall aim is to provide an opportunity to work towards living a more satisfying life. Confidentiality: A promise or assurance guaranteed by a pastoral carer that they will not to divulge the information to anyone. Confidentiality and anonymity are the codes of ethics that bind one to ensure that the other person’s issues are not repeated to anyone. Spiritual Healing: A belief system based on intangible fundamental for engaging this powerful source of energy to impart vitality, mental and psychological healing to relief the pain of experienced loss, grief, and trauma.